Does every person who grew up in a curtain place have roots like a tree? Well, trees have roots, which go very deeply to the ground to get nutrition. A human being been has other roots which connect him or her with a curtain place or territory. People have different nature, but this affection to the place where a person grows up is like putting roots. We all know how difficult and sometimes even painful it is to leave to another place after living there for a long time. It is like cutting roots, and it gives feeling of instability and vulnerability. When people start to move to a new place it is like putting new roots again, but these roots could be not so deep, like the main stem stayed in the place where a man was born. Well, how does this work with nomads? They migrate all year round. It seems that they have roots on the whole territory of their migration or even on the whole tundra. Migrating from one place to another they still are connected to their roots of migration and they feel at home and protected there. Prokopij Vylka from Priuralskaja tundra, Yamal, Western Siberia. Photo Roza Laptander. Here is a picture of a Nenets man from the Yamal peninsula. Prokopij Vylka (1967) is a handicapped person. 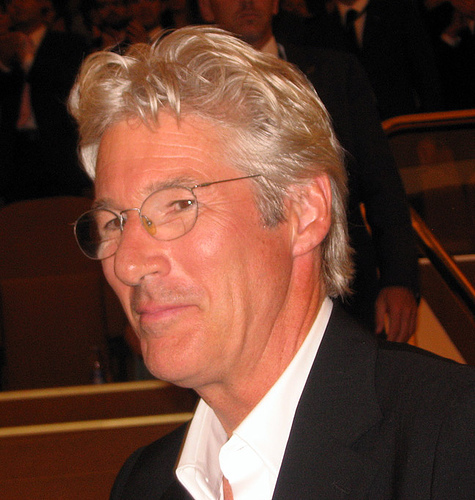 He looks very much like the American actor Richard Gere. Unfortunately, he is not as lucky as his look-alike. Once he lost his way in the winter tundra. His legs were frozen and in the Yamalo-Nenetskij regional hospital doctors amputated them till his knees. Prokopij returned to the tundra. He lives in a tent with his parents, wife and two sons. He feels himself more comfortable here than in a warm and comfortable apartment in a settlement, even as an invalid person.Here in the tundra he feels like even his homeland gives him the power to follow the normal rhythm of nomads in the tundra and to be strong in his mind. Prokopij migrates on a reindeer sledge. He even helps to collect wood and water and he is making sledges by himself for other people. He cannot throw the lasso or catch reindeer anymore. His sons do this now. 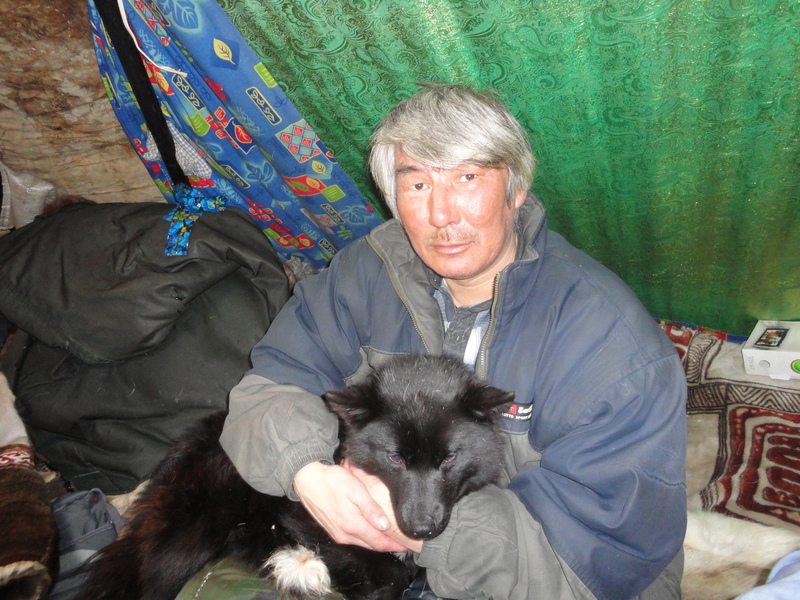 It is very seldom that handicapped people continue to migrate in the harsh arctic climate, although some Nenets continue to live this way at a very advanced age. This entry was posted in Fieldwork, Indigenous Peoples, oral history, Russian North and tagged Nenets, reindeer herding, Yamal. Bookmark the permalink. 3 Responses to Reindeer herder without legs continues to migrate on the tundra. That reminds me of the famous story of the blind Tatva Loginov, a forest Nenets fishermen, who lives in the forest tundra not far from the holy lake Num-To. He build a wooden cabin for himself and his family and goes fishing together with his wife. Andrey Golovnev made a film about him and another Russian film director another documentary. He knows even some songs that the Nenets shaman Kalliat (who was also blind if I remember right) was performing to the Finnish scholar Lehtisalo hundred years ago. Tatva does not want to leave the tundra, even to the village where a lot of forest Nenets live now. It’s not the landscape but a certain way of living in that landscape that people are rooted in I believe. My grandmother, who grew up in the German Koenigsberg refused to go back to the town Kaliningrad, when it became possible for her to do so. She argued that there is nothing left any more from her childhood even if the place and some buildings stayed the same. But of course, there is a big development of “roots tourism” and searching of roots in places that people left a lot of generations ago like with descendants of African slaves or the Irish in the US. In this case there is obviously no rooting in practices but the reconstruction of a historical rootedness that links you up to an imagined past and creates new practices, people can grew imagined roots into. Pingback: Reindeer Blog » Reindeer herder without legs continues to migrate on the tundra. Just amazing this similarity with Richard Gere! Now that so many Nenets have DVD’s in the chums, I wonder if Prokopi Vylka ever watched a movie with Richard Gere? Maybe he should invite his look-alike to the tundra at some point, and you Roza will set up the visit of the super-star, what do you think?